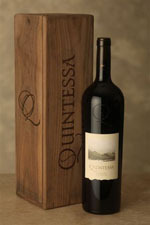 This generous donation of the Quintessential Wine Experience comes from the generous folks at Quintessa. It includes one 3.0L bottle of Quintessa 2006, a red blend from the 280-acre Quintessa vineyard in Rutherford, in a beautiful black walnut box, plus a private tour and tasting of the Quintessential Wine Estate for four guests including a tour of the Quintessa vineyard and winery and a sit-down tasting of two vineyard blocks and two vintages of Quintessa paired with artisan cheeses. Total retail value $930.00. Agustin and Valeria Huneeus developed Quintessa in 1990 to establish the property as one of the great red wine estates of the world. Valeria guided the 280-acre Rutherford vineyard with strict care for the soil and environment with a commitment to biodynamic and organic farming. The vineyard’s many microclimates, soil types, elevations, and exposures have been planted to a wide selection of rootstocks and clones, with Cabernet Sauvignon and Merlot with small plots of Cabernet Franc, Petit Verdot and Carmenère. The winery’s eco-sensitive design integrates nature and winemaking, with a gravity flow process, naturally cooled winery and caves. Grapes are crushed on the winery roof and flow by gravity into the fermentation room below. After fermentation with native yeasts and extended maceration in stainless steel, French Oak and concrete tanks, the wines are aged in French oak barrels in the caves. Winemaker Charles Thomas brings over 20 years of winemaking experience in California to Quintessa’s next decade. He leads a winemaking team that includes consulting winemaker Aaron Pott and international blending consultant Michel Rolland. Opening bid is $450.00. Minimum bid increment $25.00. Is there an expiration date on the tour and tastings? No David, there is no expiration.